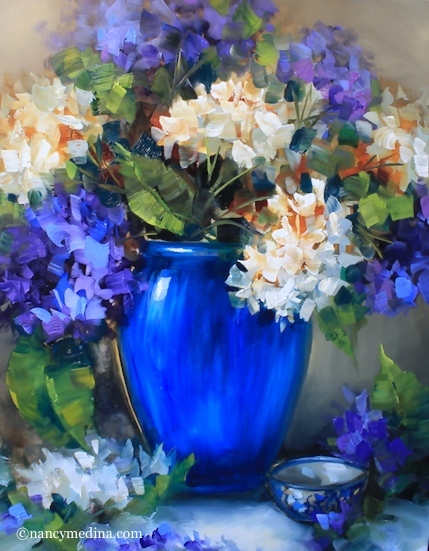 New Day Blue Hydrangeas is a new take on a favorite subject, celebrating the arrival of my hydrangea DVDs this week. While most of my hydrangeas are in green hibernation for the summer, and their blossoms are faded to a neutral gray green, one plant produced a new, tiny blue flower cluster yesterday. It seems a very optimistic prospect for a mild summer and considering how hard it was to coax that plant to give me blue instead of pink blossoms, I've decided it is a sign of good things to come!